Last Shelter is a complicated game with a lot of in-depth progression and development options. Unfortunately make of the tasks, challenges and activities in the game are not well covered by instructions and information. 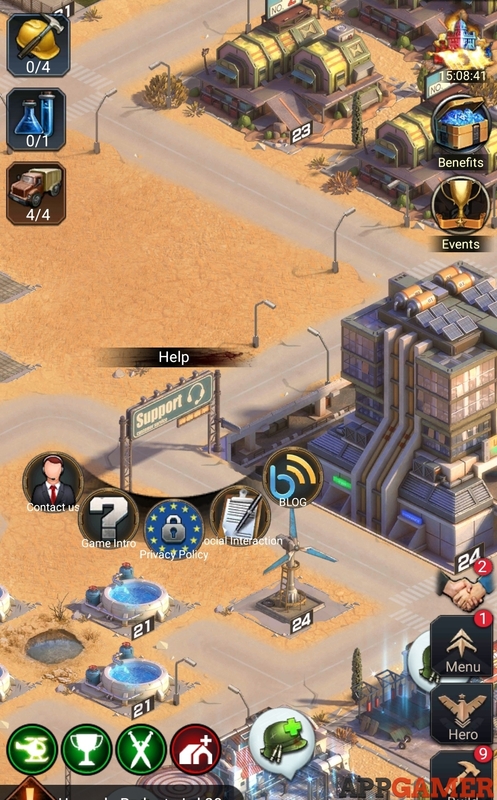 There is an in game help option found next to the Base building. Tapping on the GuideBoard sign that you see in the image below will open the 2 options for Service and Help. Help is a collection of text based help files about various aspects of the game and will answer some basic questions. Service will let you ask specific questions and contact the game developers with any problems you are having. We are yet to receive a response to queries ourselves although the regular updates to the game do seem to address issues quickly. And a website at: http://www.im30.net/ where you may get a better response to problems. If you are part of an alliance the quickest way to get answers is probably to ask in the Alliance chat feed. There are helpful folks playing and many will have had the same problems you may be encountering. We have a lot of questions and answers here for this game so you may find what you are looking for in the answers section. Or you can ask your own question for other visitors to help you with. How to change your class and which to choose Back to Top What is the best positioning for my troops in a formation?